The Model 535 maintains the ruggedness of the industry workhorse while adding the features that makes the threading operation more productive. A large chip tray and oil reservoir make the 535 ideal for longer uninterrupted threading. The 535 features a high clearance carriage making the threading operation easier and a generous top cover area that is ideal for keeping tools and work related materials handy. 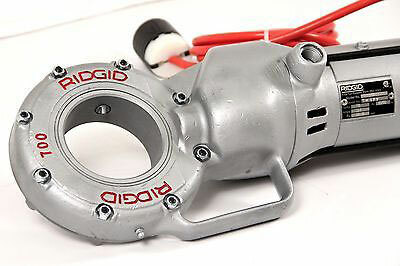 The RIDGID® 700 Power Drive has proven to be the industry workhorse in hand-held power drives for decades and has been the most powerful and durable on the market. Constructed with a rugged cast aluminum housing, the 700 PD is designed for heavy-duty applications and everyday use. It is ideal for mechanical, electrical and plumbing contractors as it can cut both right and left-hand threads in seconds, saving time, effort, and money. 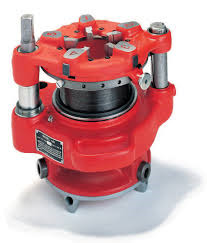 The 700 PD drives RIDGID 12-R Die Heads for 1 /8″ - 2″ pipe capacity, threads bolts 1 /4″ - 1″, and also drives 141 & 161 Geared Threaders (for increased pipe capacity of 21 /2″ - 6″). 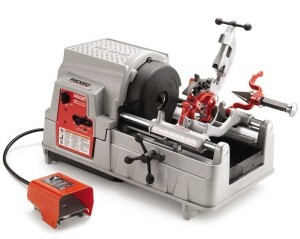 The versatility of the 700 PD is further expanded by being able to power RIDGID 258 and 258 XL Power Pipe Cutters. Gear Head: All spur gear reduction. Spring loaded adapter pawl, hardened steel spindle gear. Model 141 threads 2-1⁄2", 3", 3-1⁄2", 4" pipe with one set of dies. Note: Pipe Dies, Cutting Wheels and Cutting Oil available upon request. All dies sold at point of rental.